Everyone knows that Boston is home to Fenway park. One of the most amazing and historical baseball stadiums in America. I love going to Fenway, enjoying the game, eating a Fenway frank in the ultimate split roll hot dog bun, and watching the Red Sox win. 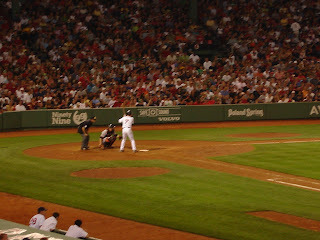 But as much as I love Fenway, Boston has much more to offer. I am less than two months away from being 25. 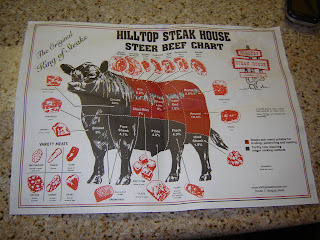 I have been going to Boston for most of the years I have been alive but until this weekend I have never been to one of most famous and notable restaurants in the area, the Hilltop Steakhouse. This restaurant and now butcher shop has been around for almost 50 years. As you travel down route 1 into Boston you see the distinct building with large cows grazing in the front. Many a times have made this trip to see lines and lines of people waiting for a table. The cows are just as famous as the steak. At one time the students of MIT stole a cow and it now resides in the student campus center in Cambridge. The cows are big and heavy - leave it to the brainy MIT students to figure out how to take such a thing without getting caught. Look out for the showing on the travel channel; the Hilltop has been listed as one of the best steakhouses in America. While I was studying abroad in Paris one of my favorite places was Le Marias. This area was historically known as the Jewish quarter and has some of the best Mediterranean/Eastern Europe restaurants in the city. The falafels were amazing. I have yet to find the equivalent in the US. 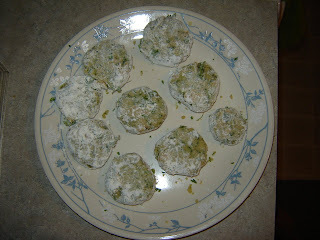 Below is a recipe I found at http://www.realsimple.com. 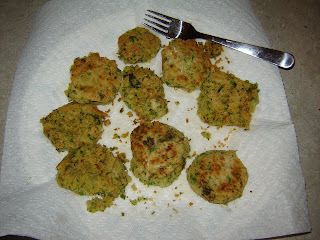 It is not quite a falafel but is easy to make and had the same Mediterranean vibe. You can have it in a pita with Tzatziki or as a part of a big Greek Salad. 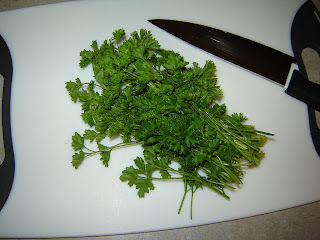 1 In a food processor, pulse the chickpeas, parsley, garlic, cumin, and 1/4 teaspoon each salt and pepper just until coarsely chopped and the mixture comes together when gently squeezed. Form into eight 1/2-inch-thick patties and coat with the flour, tapping off excess. 2 Heat the oil in a nonstick skillet over medium-high heat. Cook the patties, turning carefully, until golden brown, 2 to 3 minutes per side. They came out a bit dry but were still go a day later and reheated in the microwave. One of my favorite things about summer is berry season. I can eat all sorts of berries. I was lucky enough to have a berry farm right down the street while I was in high school. I was even more lucky to be friends with the owner who graciously allowed me to pick berries whenever I desired for free. Being on my own came the sticker shock at the grocery store when even in season a pint of blueberries is $2 at best. I can easily have a pint of berries in about 2 minute. A dollar a minute is a bit much and that doesn't bring in to consideration that raspberries and blackberries are much more expensive. Regardless of price though I made the decision long ago that fresh fruit is not something I will miss out on. 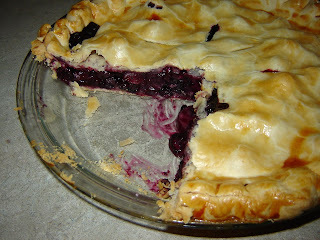 Thus today, a perfect sunny summer day, I decided to make blueberry pie. Blueberry cake would also have worked; however, it never turns out as well when I make it as opposed to my mom. Preheat oven to 325 degrees with rack at lowest setting. Put one piece of pie crust and put in pie pan. 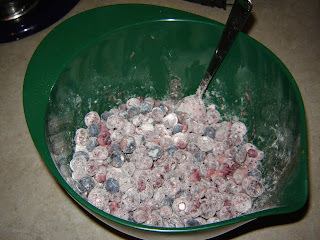 In medium bowl put frozen berries. Toss with sugar, flour and salt. Pour in orange juice and mix together. 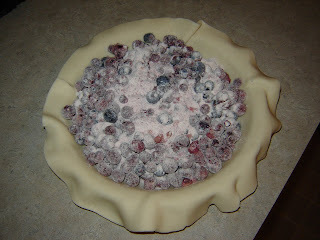 Add berry mixture to pie dish making sure that any additional dry ingredients gets spread evenly on top of blueberries. 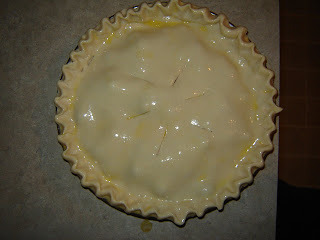 Add other pie piece on top and crimp edges together with fingers. Lightly brush a beaten egg over pie top being careful not to have too much excess egg in any one spot. Cut 4-5 steam slots on top of pie. Put in oven for 1 hour. If needs to be a bit more brown leave in oven up to 15 more minutes. Cool. The hard part is letting the pie cool. This allows for the inside of the pie to stiffen. 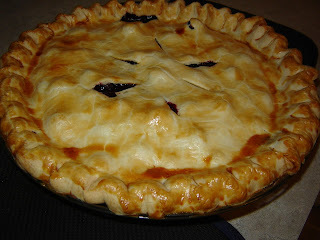 If you cut into a warm pie the center will still be liquid and will run out. I found this recipe to be quick, easy and delicious. Homemade pie crust can be used but to me takes too much effort. Store bought Pillsbury works well with little effort. Just roll out a few times before use. I was hoping Wednesday night I would have been able to post that I had just come from an amazing meal at Babbo. Getting reservations as Babbo is probably one of the hardest things I have tried to finagle recently. I am almost proud to admit this is not really my obsession but a co-worker’s. I simply jumped on board as added support and wanted to lend a hand at trying to accomplish the task of landing a table at Babbo. The rules are pretty straight forward. The restaurant is opened from 5:30-11pm seven days a week. You can call one month in advance of the numerical date of your choice in hopes of getting availability. There is a special reservation number that is open from 10am -11pm. Weekend reservations are essentially impossible. For work I travel a fair amount. Needless to say one of my first priorities after I find out I am going somewhere is to search for where I want to eat. Not to boost but I have gotten really quite good at these Internet searches. Thus after finding out that I would be in the city for a day I proposed trying to get reservations at Babbo on Wednesday night. This all happened about two weeks before the actual date but lucky after about 12 attempts of getting through I was told there was an opening at 5:30pm or 11pm. I quickly took the 5:30 slot. But this post is not about Babbo…unfortunately the visit got postponed by one day making the dinner at Babbo impossible once again. 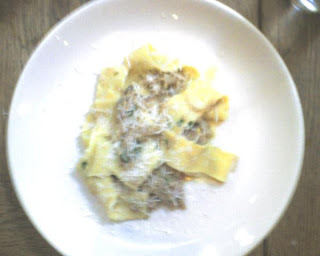 Mario Batali has several other restaurants in the city and Lupa ended up being the pick for the night. It is situated on a non-descript side street just north of W. Houston street and is fairly small, probably not seating more than 50 people at a time. Being there at 5pm it was quiet but the time the meal ended at 8pm the bar was full as were all of the tables; people were being turned away at the door. There were 5 of us dining which is enough to get quite a variety of food to sample. Nothing was disappointing. We started with salads and a platter of prosciutto. The slices came out on a long wooden board and was easily enough to feed two people. There was a basic mixed greens salad, Misticanza but I was hoping for something a bit more unique. This came in the form of a dandelion greens and pig jowls. (Guanciale: Cured pig jowl.) The menu was in Italian; luckily the menu had a nice glossary on the back for translation. Batali is famous for weird and eccentric additions to the menu. I found the glossary quite helpful. Pig jowls in Italian is much more appetizing. 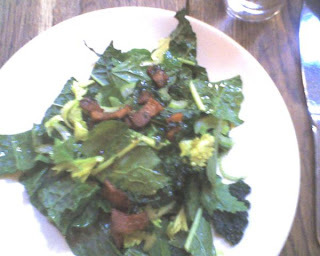 The waiter brought out plates of greens and a separate saute pans with the pieces of pig jowls and oil. The pig jowl pieces and hot oil/grease was poured on top of the greens. In reality the pig jowl was bacon. The salad ended up being quite good with a fatty/salty taste. I don't really like bacon but even I found this enjoyable for a one-time try. Who can turn down the opportunity for pig jowls? Not wanting to heavy of a meal, we decided on pasta dishes for the second course. Pasta at Lupa is all handmade. 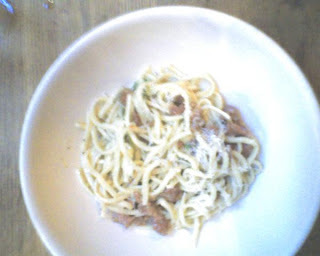 We got the two specials one with a Pork ragu, the other with pork sausage and a butter and basil sauce. It occurs to me now that this must have been pig night at Lupa. 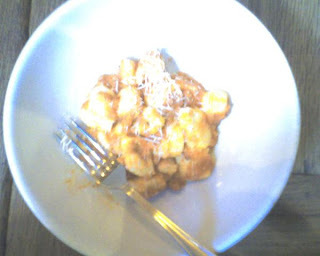 Some else got a regular menu item of Gnocchi with ricotta. The little tasting I had melted in my mouth, smooth and creamy. If I went back I would order this. The serving were smaller than in most restaurants but enough to fill you up and definitely worth the money. Although full I am not one to pass up desert, especially not one in a famous restaurant. We decided on two. 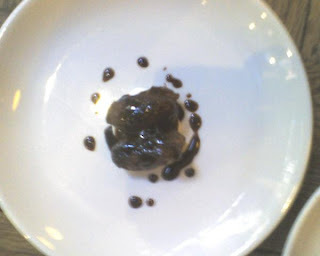 The first, Lupa Tartufo, basically a ice cream ball with a cherry in the center. 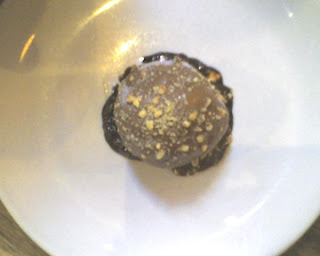 The ice cream is then covered in chocolate or in this case hazelnut. It was devine and perfect on a summer night. This was not my first pick but I am so happy we ended up getting it to share. The second was African spiced dates with mascarpone cheese. I think this was by far the most different desert choice. We it came to the table we certainly had a laugh. The dish was not the most appealing to the eyes. It was so sweet and heavy, not in a bad way but something to warm you from the inside out on a cold winter night. I loved it. The only down side was the wine list, large and completely Italy. I don't drink Italy wine and the only thing I would have added to this meal was a nice glass of deep red wine. The service was great from the hostess to the waiter, and the runners. Everything flowed smoothly without any feelings of being rushed or waiting. All in all....yum, yum. I would return anytime. Although at some point in my preteens I dabbled in going vegetarian, the phase luckily only lasted a few weeks. Being born in Iowa there is really no escape from beef or pork. I need variety and for me meat provides the extra zing in my meals. 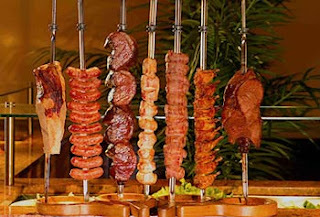 Tonight I had an interesting experience at a Brazilian steakhouse. This particular steakhouse recently opened restaurant in Portland, Maine and is the second offspring of the Gauchos Churrascaria chain, the first being in Portsmouth, NH. The meal starts out with a sensible salad bar. Nothing too special but fine quality veggies to choose from nevertheless. Next, warm starters grace the table. Now this was a Carb fan heaven. Plantains, yucca and round potatoes hot and yummy on the table. The plantains were fried with some sweet sauce. I honestly could have eaten them all and been done for the night very satisfied. The yucca were prepared similarly to thick steak fries and tasted like fried dough sticks. Nothing too special for flavoring but unique all the same. This was the first time I had ever had yucca. Once you start eating it is a never ending flow of food. As soon as the table started munching on the carbs, you are asked if you would like a small plate of salmon. This was also very good and could have been the meal in and of itself. No sooner had the salmon arrived when the onslaught of meat came skewered to the table. This was overwhelming to say the least. There are 11 different meats to pick from. My earlier statement of variety does not really apply here. I am a firm believer of the statement " Too much of a good thing". Below is the list of options. Prime Rib (Alcatra) - A Gauchos favorite! I, of course, had to try every piece (except for the bacon wrapped filet and sausage). I really do not like bacon. And there is just something wrong with a bunch of meat ground together and put in casting. Trying much of the meat left feeling not only full to my stomach but amazed and disappointed all at once. There were some really good choices - the short ribs were divine. The Pork ribs were overcooked and dried out. The card at the table signals if you would like more. Green = Go. The time all 11 options were brought I was done. I would like to meet the the person who could have seconds. Now if eating 11 different types of meat at once didn't make you feel carnivorous enough, you actually had to participate in the taking of the food. The men would line up along the table with whatever meat skewer was theirs. They would place the little drippings plate on the table and then hold the skewer and cut. As this is happening you were expected to take your little tongs and grab the meat as it falls. All of this excitement leaves little room for dialogue. By the time the meat intake slows you are so full it is difficult to carry on conversation - my mind was on my belly. Desert was also offered but I must say no one at our table (including the two desert-a-holics) could not fathom having more food. I left thinking what a good time; I don't know if I can come back for more. This recipe was adapted from a special drink served at L'Escoffier restaurant in the CIA Hyde Park campus from a graduating senior Stephanie. Not only is it refreshing and yummy, the colors are perfect for any kind of Fourth of July celebration. Since I don't want to trump a special concoction from an up and coming chef I will give a brief variation of the recipe she so graciously shared. Mix two parts of each liquor with one part sugar. Mush berries with sugar and put in bottom of glass. Pour combined vodka and cremant and pour over berry mixture. Add lime juice. 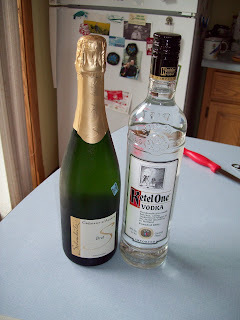 The Cremant d'Alsace is a regional sparkling wine that quite frankly I had never heard of until this recipe. It took my mother some Internet searching to determine what exactly it was and then another search to actually obtain a bottle through special order. Of course this was done in the state of Maine so sometimes the extra steps are not necessary if you are in a more sophisticated location. Warning: Two of this drink is one too many. Consider yourself forewarned.